Phonics tests for six year olds have started in schools in England. But what do parents need to know about this system for learning to read? 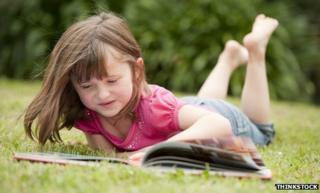 Phonics has been promoted by the government as the best way to boost reading standards. Here are five key questions. The phonics approach teaches children to decode words by sounds, rather than recognising whole words. The emphasis in early years teaching is on synthetic phonics, in which words are broken up into the smallest units of sound (phonemes). Children are taught the letters (graphemes) that represent these phonemes and also learn to blend them into words. So, at its most basic, children are taught to read the letters in a word like c-a-t, and then merge them to pronounce the word cat. A phoneme can be represented by one, two, three or four letters (such as "ough" in "dough"). Children are systematically taught around 40 phonic sounds and the combination of letters used to represent each sound. Most sounds, however, have more than one way to spell them. For example, "e" in "egg" can also be spelt "ea" as in "head" or "ai" as in "said". Graphemes are grouped together and children progress from one group to the other and will be tested at the end of year one, when they are six years old. So is everybody agreed that phonics is the best way to teach a child? No. The government's phonics-only approach is controversial, with many teachers and educationalists advocating a more balanced approach in which other reading strategies are also used. "Some children will need more phonics-teaching more than others," says Andrew Lambirth, professor of education at the University of Greenwich. Children's author Michael Morpurgo finds out just what systematic synthetic phonics are and why some, not least Nick Gibb, the minister for schools, are so keen on them. Cbeebies Grown-ups: What is phonics? There are some who feel "reading" phonetically, decoding, is not the same as reading, says Lambirth. "It is not necessarily reading for meaning or for pleasure." The books that have been devised in order to support synthetic phonics offer a restrictive diet, says Lambirth. He says the worry is that some teachers will focus too much on these books in order to teach to the test and "may not include the other wonderful books that are out there." "Teachers and parents need to complement the emphasis on decoding with the delights of meaning-making." Another problem, says Dr Lambirth, is that the English language is not written in a consistently phonetic way. What are the other methods of teaching reading? The alphabetic method of teaching reading - ie not phonics - dominated the teaching of reading up until the 19th Century. This involved teaching children to recognise and name the letters of the alphabet, both capital and lower case, in alphabetical order. "Teachers will use a variety of strategies because no child learns in the same way," says Ian McNeilly of the National Association for the teaching of English. "There are many methods which may be used in combination. "In the look and say method, children are exposed to pictures and stories from an early age and will learn to recognise complete words. This is, if you like, at the opposite end of the spectrum to synthetic phonics. "The use of learning aids like letter cards and alphabet guides, recognising rhyming patterns and the use of powerful texts to engage children's interest are among some of the strategies used." Another method, the "look and say" teaching technique, also known as the whole word method, was promoted by American psychologist Edmund Huey from 1908 and became established in the UK in the 1940s. In the 1950s and 1960s the main characters used to promote this method were Janet and John, who became hugely popular with school children. The "whole word" approach was to repeat words on each page enough times that children memorised them. Phonics is not new. It began to be used after 1850, according to Sounds Familar: The History of Phonics Teaching. It has often been combined with other strategies, including using the context of a story or the syntax to help predict the next word. The idea is that a child knows how language works implicitly. In 1955, American reading expert Rudolph Flesch published what became the "bible" of the phonics movement, Why Johnny Can't Read, on the state of education in US schools. Flesch maintained that the "look and say" method was encouraging illiteracy. The book also influenced policy in the UK. Why are children being taught made-up words? One controversial aspect of a phonics-based approach is the use of fabricate words to test children. Children at the end of Year 1 will be asked to read 20 words and 20 "made-up words". According to a number of teachers' unions, the non-words include "voo", "terg", "bim", "thazz", "spron", "geck", "blan" and "fape". Unions have suggested that including made-up words will frustrate youngsters who can already read, and confuse those with special educational needs, or for whom English is a second language. "The reason behind them is to show that children are able to decode, despite not knowing the meaning of a word," says Dr Lambirth. "The idea is that once a child has the skills to decode they can then go on to think about meaning. Other people though say this is not the basics that the basics also includes engaging in the delight of meaning-making right from the beginning." Why does the reading debate keep returning? This debate has been going on for decades, with the pendulum swinging in one direction and back again. There was a more balanced approach in the 1970s and 1980s, where a range of schemes were used and teachers had more freedom on how to read, says Dr Lambirth. "These influences can still be found but the current government sees the other influences as just wasting time. To the government, the phonics only approach seems to be a logical one. There has been a shift in focus for government from secondary to primary education, says Dr Kathy Goouch reader in education at the department of Professional Development Canterbury Christ Church University. "Learning about phonics is just a tiny part of learning to read. If children learn to read by using other strategies as well, it sometimes takes longer than simply being taught to decode words. Phonics information is something that can be tested easily and it provides short-term results. Governments often look for easily measurable options, so that they can tick boxes and say they have successfully raised standards." But whatever the state of the debate about phonics v other methods, many education experts agree that one of the key factors for children is the status of reading at home. "Research has shown that where children are born into a family where reading and talking about books is part of their world, the culture of reading is already pleasurable," says Lambirth. This helps to produce better readers. "In some homes, however, books aren't that important. Children sometimes need to be introduced to the pleasure of reading books in school from an early age and this becomes one of the most important jobs teachers need to do."